Last weekend, Russ and I attended the annual Space Coast Birding and Nature Festival, centered in Titusville, Florida. It was a splendid way to spend a few days in January, for birders of any level. The field trips give people new to the area a great overview of the best birding spots and expert help in finding and identifying the birds. Many people who live in central Florida year-round or throughout the winter learn about new hot spots, make new friends who are interested in birds, and get tips about recognizing their local birds and understanding their behaviors. I was there to give a talk and to lead a field trip for beginners, but that left a lot of time for birding. I had three primary goals: to take a photo of a gannet, even if it was extremely far out, to take a better photo of a Black Skimmer’s eye to show the vertical pupil—something I just discovered that skimmers have, and to take a halfway decent photo of a Belted Kingfisher. For some reason that bird is my nemesis species as far as photography goes. I’ve got lots and lots of photos of kingfishers from a long distance, but none of them up close and personal. But I also just wanted to see lots and lots of birds. Russ and I went to some of our favorite places, and ended up seeing well over 100 species. The Viera Wetlands in Melbourne, a bit south of Titusville, is great for a wide assortment of wading birds at very close range, including nesting herons and anhingas, and a generous supply of raptors. In a single day, we had 10 species of hawks and falcons in that one small area, including the splendid Crested Caracara. We went there one day when the weather was gorgeous and the lighting perfect, and another day when the skies were densely overcast. On neither day did a kingfisher sit anywhere where we could get a photo, though one of them did a great tease, waiting on a nearby perch until my camera was almost pointed at it. At that moment, of course, it vanished. We also visited the wildlife loop on Merritt Island National Wildlife Refuge twice, again on one wonderfully sunny day, and then on a day when the lighting was awful. Hundreds of Black Skimmers were snoozing on the beach by the bridge on the way to the Island. Although I didn’t get as close as I wanted because there were just too many people on the beach, I did get a better photo of some of their eyes. As always, I saw bazillions of kingfishers, but only on the second day, when the light was very bad, did I get serviceable photos. They’re much grainier than I wanted, but for now they’re as good as anything I’ve ever had. The bird I most wanted photos of was the Northern Gannet. I saw my lifer—both the first and the last gannet I’ve ever seen in the wild—in November 1988 on Cocoa Beach, so Russ and I spent one afternoon on Cocoa Beach, but that was unfortunately when the light was very poor. But as I said, I didn’t care how good my photo was as long as it showed an identifiable gannet, and that was easy enough. I didn’t have to work very hard to see them, this being late enough in winter that a great many have made their way to the Florida coast. My photos show them in all plumages from immature through adult. Russ and I also went to the Canaveral Seashore on a sunny morning, and there I got more photos. Many of the pictures are better than I expected, but it’s good that I set my goal nice and low, because not one of my photos is what anyone would call good. I’m already making plans for next year’s Space Coast Birding and Nature Festival. It’s a great excuse to get down where an array of birds are abundant and easy to see, right when I need a little break from winter. Now it will be fun to return home to spend time with my own dear chickadees and other winter-hardy birds. When I walked into Robert Tweed’s senior English class for the first time in 1968, I was one petrified 16-year-old. This tall, handsome man, not just a regular English teacher but head of the department, with his oh-so-proper English-sounding name—what could be more intimidating to a working class girl? But the moment Mr. Tweed spoke, his soft, gentle voice made me feel that everything would be okay. He gave our class an exposure to a wide variety of films, plays, and great literature, and led fascinating discussions that led us to appreciate them on a much more mature and even sophisticated level. He assigned one major term paper on our own choice of theme, based on five novels we chose from a recommended list. I chose the topic “War,” and read All Quiet on the Western Front, The Red Badge of Courage, A Farewell to Arms, The Bridge over the River Kwai, and Catch-22. Yes, Catch-22—Mr. 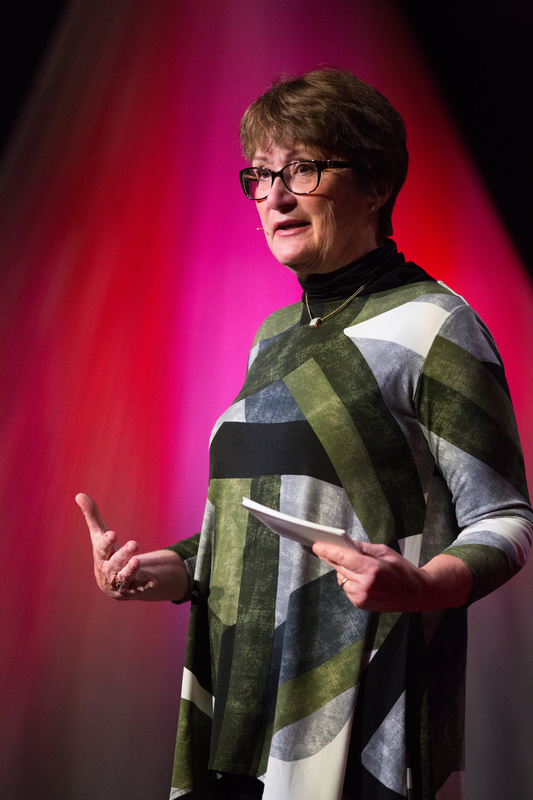 Tweed encouraged us to read controversial books, didn’t set them apart from more traditional literature, and not only expected us to discuss them intelligently, but led by example. It was exciting to realize that a man who dressed, spoke, and carried himself so formally was open to discussing such a wide spectrum of ideas and equally varied ways of expressing them. His class freed me up to start questioning some of my own long-held ideas and beliefs, and enlarged my view of the world and my place in it. We also spent a lot of time on grammar, including diagramming wondrously intricate sentences. I loved this, and the ever-increasing complexity made the diagramming more challenging and fun for me. Mr. Tweed patiently listened to a lot of complaints about sentence diagramming, but in the end defended it not only as an important way of ensuring that we truly grasped the fundamentals of grammar but also as a valuable exercise in logic. He had a way of making me feel proud to be a geek. No one in my family, and none of our family friends, had gone to college. Many students’ parents encouraged them to go to college even if they hadn't gone themselves, but mine were very mistrustful of what my dad thought was nothing more than a breeding ground for hippies. I had no clue what college even was. But Mr. Tweed was not just adamant that I should go—it was as if he could not even conceive of my not going. He was one of a group of teachers who came to my house unannounced to persuade my parents to send me to college, and was one of the ones responsible for my receiving a scholarship to the University of Illinois. He also encouraged me to take a test that placed me in a special freshman rhetoric class that proved to be one of the most memorable and important college classes I took, and obtained the reading list so I could prepare myself. Imagine having a teacher who took that much interest in his students! At a very fundamental level, I owe everything I’ve achieved in my life to Robert Tweed. I can’t remember any teacher revealing as much about his personal life as Mr. Tweed did, yet he was also one of the most modest and unassuming teachers I’ve ever had, and the most profoundly sincere. He told us that he’d grown up on a farm and for a while when he was a child, his family was on welfare. I drew from this my first inklings that I could dream of and make for myself an entirely different kind of life from that I’d always known. What an empowering thought! I don’t remember him mentioning birds specifically in his classes, but the skills he gave me and, more importantly, the confidence I started to feel under his encouragement provided the foundation for my career as a writer and public speaker. Mr. Tweed was a bachelor, and the year we had him was the year he started dating his wife Rosemary. One of the other students happened to see them on a date, and when she mentioned it in class, he blushed adorably. When Russ and I were in college, we visited West Leyden once after Mr. Tweed had married, and he invited us to dinner to meet “my Rosie.” He was so proud to introduce us to her! I’d not grown up knowing that men outside of those in movies could be so deeply in love. Their relationship was lovely to see. It’s not until we are decades removed from high school that we can appreciate how much our teachers influence our futures, for better and for worse. I was lucky enough to comprehend what Robert Tweed gave me in time to thank him. And I was doubly blessed, because in the past decade, the man who was one of my most inspirational teachers also became one of my most beloved and treasured friends. I visited him a handful of times, and Russ and I attended his 80th birthday party in La Crosse. We lived hundreds of miles apart, but he and I had many lovely telephone conversations discussing everything from music and literature to politics, religion, and fundamental issues of right and wrong. In the past couple of years, his health began to fail, but his mind was as quick-witted and fully engaged as ever. How I will miss this brilliant and gentle man who taught me English, and gave me the world. 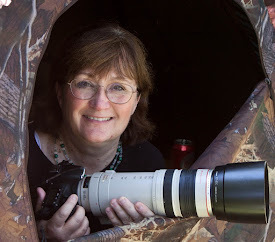 I’m headed to Florida’s Space Coast Birding Festival the last weekend of January. I will be spending a lot of time gawking at spectacular birds so close that I’ll need to crank down my zoom lens to fit them on my camera screen. But whenever I’m on the coast, I’ll be scanning the horizon, trying to pick out a very distant Northern Gannet. In 1988, Russ and I spent Thanksgiving in Florida, and brought our kids to Cocoa Beach. They all went swimming while I manned my spotting scope, searching for any sign of a gannet. After a long search, I finally picked one out, diving far far out in the distance. It’s the only gannet I’ve ever seen in the wild. Russ had already seen several at close range, when he was out on the Atlantic on a research vessel while working on his Ph.D.
Gannets are huge birds, averaging over 3 feet long from tip of beak to tip of tail, with a 6-foot wingspan, and they’re fairly heavy, weighing over 6 ½ pounds. They fly 30–130 feet above the water, and when they spot a fish set their wings in a steep arrow and plunge-dive straight down, hitting the water at a speed of over 60 miles per hour. An extensive network of air sacs between their muscles and skin absorbs the shock of impact. Even from a distance, the sight of this plunge-diving gannet is thrilling. Gannets breed in the seas of the far north. The gannets that breed in North America are concentrated in 6 breeding colonies, three in the Gulf of St. Lawrence off Québec and three on the Atlantic coast off Newfoundland. During winter, they fly and fish their way down the Atlantic, largely within waters overlying the continental shelf from New England to Florida and then west along the Gulf Coast to Texas and northeastern Mexico. Adults tend to stay much further north than young birds. The Birds of North America entry for gannets says some first-year individuals may remain in tropical waters during first breeding season, but more young gannets remain in the Gulf of Mexico than most scientists realized before the BP oil spill. A paper published in October 2011 in Biology Letters said that using modern bird-tracking techniques, scientists have learned that more than twice as many young gannets winter in the Gulf of Mexico than were believed to, and yet adults are far less common in the Gulf than scientists thought. Northern Gannets suffered the highest oiling among beach-wrecked birds recovered after the spill, as I saw firsthand with one of my friends, Vickie. She and I spent a few hours in August 2010 attending a press briefing at the Theodore Oiled Wildlife Rehabilitation Clinic near Mobile, Alabama. The only birds we saw in the treatment room were immature gannets. The staff, including the US Fish and Wildlife Service representative briefing us, seemed mystified why so many gannets had become oiled, and why every one of them was an immature, but this was during the height of the breeding season, when adults were thousands of miles north. Gannets fishing are essentially taking random samples of the waters—the spill was so huge, and so dispersed, with some of it well below the surface, that of course a great many of the birds diving deep into the water and swimming about were going to find themselves in oil plumes. Hundreds of oiled gannets washed to shore, a small percentage of the actual number oiled. Gannets live entirely in the deep water far from shore, and most of their bodies aren’t carried so far. Fortunately, overall gannet numbers are strong, and assuming we don’t hit them with more Gulf oil spills, they should fully recover. I’m hoping against hope to see one in Florida. I need to cleanse my brain of the images of those poor oiled gannets on clinic tables, wrapped in blankets and struggling for survival. Seeing one flying strong above the ocean, setting its wings, and plunging into the depths is exactly what I need. I have a painful confession to make. Here it is, January 19, 2012, a year when news reports from all over the continent and beyond are telling of a Snowy Owl invasion of epic proportions, and I haven’t seen a single one. I’ve driven through Superior and along Highway 13 to and from Port Wing several times this season, and Russ and I scoured the Duluth Port Terminal twice, but I just can’t seem to spot one. I know I’ve seen my fair share over my lifetime, and expect I’ll eventually get one this season, but it’s very strange for me to be so far behind on something this wonderful. Oddly enough, although the Duluth-Superior area has had a typical number of Snowy Owls this year, we don’t seem to have any more than usual. 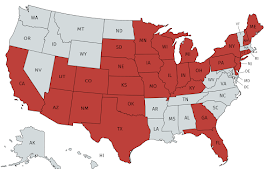 Meanwhile, they are appearing in places far south of where they usually winter throughout the continent—there have been sightings from Nova Scotia to the Olympic Peninsula, and as far south as Oklahoma, Kansas, and southern Missouri. One poor hapless Snowy Owl flew thousands of miles over the ocean, making it all the way to Honolulu. Unfortunately, the spot it was drawn to happened to be the Honolulu airport. Airport officials decided it posed a threat to aircraft and rather than trapping and relocating the poor, exhausted bird, they shot it. Snowy Owls in other places have been killed or injured by cars and power lines, and some have been retrieved that were clearly starving. Ironically, this year they didn’t leave the Arctic because of a food shortage—quite the opposite. This was a banner year for lemmings, and the abundance of food ramped up Snowy Owl reproduction. Lemming populations fluctuate wildly, and in response to occasional population busts, it’s believed that some Snowy Owls breed only once in every three to five years. In average years, pairs produce an average of 3–5 chicks, and when food is abundant, as it was this year, they average 7–11 chicks in a clutch. When food is abundant, entire clutches often survive, resulting in a whole lot of owls on the tundra in fall. Owls are territorial in winter, and the birds most capable of driving other birds away get the biggest, most productive territories. Females are significantly larger than males, and adults are more capable of defending a territory than young birds, so the birds that have the hardest time getting territories and are driven south are the young males produced last year. Sure enough, most of the birds that have been identified in the US this year have been young males. As David Evans proved with banded Snowy Owls returning to the Duluth Harbor year after year, some owls do survive the round trip and make it again and again. But there are lots of dangers, especially in the urban and roadside areas where we’re most likely to see them, and many won’t make it. I’m headed to Florida this week, so unless I manage to pick one out as we’re driving out of town or along the Interstate in Wisconsin, I’m probably not going to be seeing a Snowy Owl until at least February. Fortunately, that’s often the month with the most owl sightings in our neck of the woods, so it still looks good for my finding at least one this year. And that’s hardly going to be our last chance to see them. What with all the owls produced this year, those abundant lemmings have to be decreasing—a family with nine owlets and two parents consumes 1900–2600 lemmings just between May and September. So food shortages next year may drive Snowy Owls our way again. With luck they won’t skunk me two years in a row. Russ and I are headed to Florida for a few days next week, to visit our son and so I can help out with the Space Coast Birding and Wildlife Festival. I love being in northern Minnesota in winter because I truly love chickadees and owls and all our other splendid winter birds, but every now and then it’s lovely to break away and see birds that never make their way north, and when there’s all the cold of winter with none of the snow, I must say I don’t mind wandering south for a bit. The Florida coast is filled with a rainbow of spectacular birds, but of all the ones I enjoy down there, a few stand out as my favorites. And one of these is the Black Skimmer. Every time I see skimmers, I’m blown away yet again by their bizarre bill. It’s brilliant orange and black, and the lower mandible is significantly longer than the upper, jutting out well beyond the upper bill in a wonderfully peculiar adaptation that allows them to capture fish in a unique way. Skimmers glide low over the water, usually on motionless wings, their lower mandible tip slicing surface of water. When the lower bill contacts a fish or other object, usually within just three centimeters of the surface, the upper mandible clamps down while the head and neck tuck downward, securing the fish, which is then turned and swallowed headfirst or carried crosswise in the bill to the nest. Skimmers do most of their fishing at low tide, and so may fish at any time of day or night. but from straight ahead, it is surprisingly flat as a knife. At hatching, a baby skimmer’s mandibles are equal in length, but by the time it fledges at 4 weeks, the lower bill is already nearly 1 cm longer than the upper. This kind of unique adaptation seems like all a bird would need to set itself apart from other species, but skimmers have another unique feature. Their relatively large pupil constricts to a narrow vertical slit—something the eye of no other bird species can do. Scientists haven’t settled on the reason why skimmers have this cat-like feature, but it may be an adaptation to protect the retina from the glaring bright light of sun above and sparkling water below, or it may enhance their vision for nocturnal feeding. I personally never noticed this before I read about it in the Birds of North America Online, so I carefully went though all my close-up shots of Black Skimmers. The black eye is so difficult to see against their black head feathers that I had to tinker with the “Fill Light” feature of my photo editing software to fade the iris just enough to see that sure enough, the pupil is a slit. If you click on the next two photos, and then right-click them on Flickr.com, you can view them in a larger size to try to see this cool thing. Except while fishing, Black Skimmers gather in large flocks. Like most birds, they usually face directly into the wind, which keeps their feathers aligned and unruffled. A gathering of skimmers is a gorgeous study in black and white and orange whether they’re all standing still, all asleep, all preening, or all flying. Interestingly, they show what’s called contagious behaviors, and you can’t help but notice that if one skimmer is doing something, so are its neighbors, the behavior spreading through the whole flock. The more I learn about Black Skimmers, the more fascinating I find them, and the more I want to capture each one of their features and behaviors. So whatever else I find myself doing in Florida, I know I’ll be taking photos of skimmers wherever they may be. Last week, researchers from Dauphin Island Sea Lab in Alabama released their findings from a two-year study focusing on the diets of Tiger Sharks in the Gulf of Mexico. Their report made national news because it said the sharks are feeding in part on land-based birds such as woodpeckers, tanagers, meadowlarks, catbirds, kingbirds, and swallows. I wasn’t surprised—there are many records of birds in the stomachs of tiger sharks, and a great many of the millions of birds that migrate over the Gulf in spring and fall are killed in storms and, perhaps more than any other cause, by becoming disoriented by the lights on oil rigs and colliding with the rigs and with one another. Somehow people are so good at closing our eyes to what we don’t want to see that few had even considered how the lights on oil rigs set right in the midst of the largest swath of bird migration in North America would naturally be drawing large numbers of birds to their doom and the sharks’ delight. Of course, this report will in no way affect the presence of the Gulf’s oil rigs. The best we could hope for would be that the oil companies would employ already existing radar technology to turn lights on when aircraft or ships are in the vicinity, but otherwise keep outside lighting off during nocturnal migration, ensuring human safety while conserving energy and protecting birds. But I have no expectation that the oil companies would ever consider such expensive technology without legal and public pressure, and no expectation in today’s political climate of that happening. I find myself growing increasingly pessimistic about issues like this. But then I realize that I’ve seen many impossible dreams achieved in my lifetime. Lake Erie, pronounced dead in the early 1970s because its levels of eutrophication and pollution were thought to be beyond the point of no return, now teems with life. Rivers that were literally afire then now have nesting Bald Eagles along their shores. Every California Condor in existence was taken into captivity in 1987, most hving dangerous levels of lead in their blood and body tissues. At that time the world’s entire population of condors numbered in the 20s; now there are almost 400, over 180 flying wild and free. Snorts of derision from naysayers even greeted a young president’s dream that we would one day send a man to the moon and bring him home safely. If optimism must be tempered with realism in order to make dreams achievable, pessimism must be tempered with realism to dream at all. Working together, optimists and pessimist accomplish the impossible. Rick Bayan defined the word “cynic” in The Cynic’s Dictionary as “an idealist whose rose-colored glasses have been removed, snapped in two and stomped into the ground, immediately improving his vision.” An optimist’s rose-colored glasses do indeed cast a pretty haze over the hard brilliance of reality. A pessimist’s glasses cast a dull gray haze over everything. But only a cynic would stomp either of those glasses to the ground, relegating himself to the dark exile of self-imposed blindness. Cynicism is fundamentally lazy. If one decides that it’s pointless to screw in a light bulb, one remains in the dark forever. So I’ll keep plugging away, trying to make people aware of the plight of birds migrating over the Gulf and trying to get optimists and pessimists to work together to find realistic solutions. My rose-colored glasses may sometimes dim to gray, but succumbing to cynicism would take away hope—that thing with feathers that perches in my soul and keeps my eyes and heart open to beauty and my responsibilities toward the birds I love. 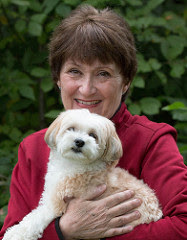 Production of today’s For the Birds was made possible in part by a generous grant from Vickie and Barry Wyatt. “Life is not measured by the number of breaths we take, but by the moments that take our breath away.” Last week someone posted that quote on Facebook. The words deeply resonated with me, and apparently with a lot of my birding friends, who instantly pressed the facebook “Like” button. I think over a lifetime, we who spend time in nature are given more opportunities for having our breath taken away than many people are. Whether we’re blown away by a view of the Grand Canyon, a spectacular sunrise, a particularly brilliant and flowing display of northern lights, a sudden glimpse of a Respendent Quetzal, or a chickadee alighting on our finger, the more time we spend in nature, the more we get to experience magical moments. Of course, it’s hardly as if birdwatching is the only thing in my life that has given me genuinely breathtaking moments. If I could retrieve from memory every single moment that took my breath away, the list would include lots of moments not remotely connected to birds, such as the moment the boy I loved with all my heart, who became my husband, first told me he loved me at a Chicago Cubs game; the moment I first held each of my newborn babies; moments when I witnessed some of my children’s firsts; the moment I made a sudden and unexpected breakthrough with a student struggling with math; and the moment I opened an email from a former student who recounted what I meant to her—those have been among the most sublime, thrilling moments in my life. But any list itemizing my breathtaking moments would include a lot connected with birds. One happened when I was seven or eight. My grandpa had told me that if I practiced whistling really hard, I could get a cardinal to answer. I tried and tried, and one morning when I was in my bedroom trying to match the song of a cardinal down the block, suddenly he flew right to the maple branch brushing against my window, peeked in at me, and sang back at me. “Breathtaking” is a lame and clichéd word for the joy I felt at that unexpected moment, but it was the literal truth. Another magical moment came when I was birding in Madison on December 3, 1977, and whistled in my lifer Pine Grosbeak. If seeing him weren’t thrilling enough, I put out my bare hand, and he alighted right on my finger and looked into my eyes. He flew to a nearby branch within a second or so, but my heart thumped at top speed for a long time after. When I was walking in downtown Los Angeles in 1994, I heard some White-throated Swifts overhead and wheeled to a stop to look at them with my binoculars. A homeless man who’d been lying on a bench under some newspapers asked what I was looking at. 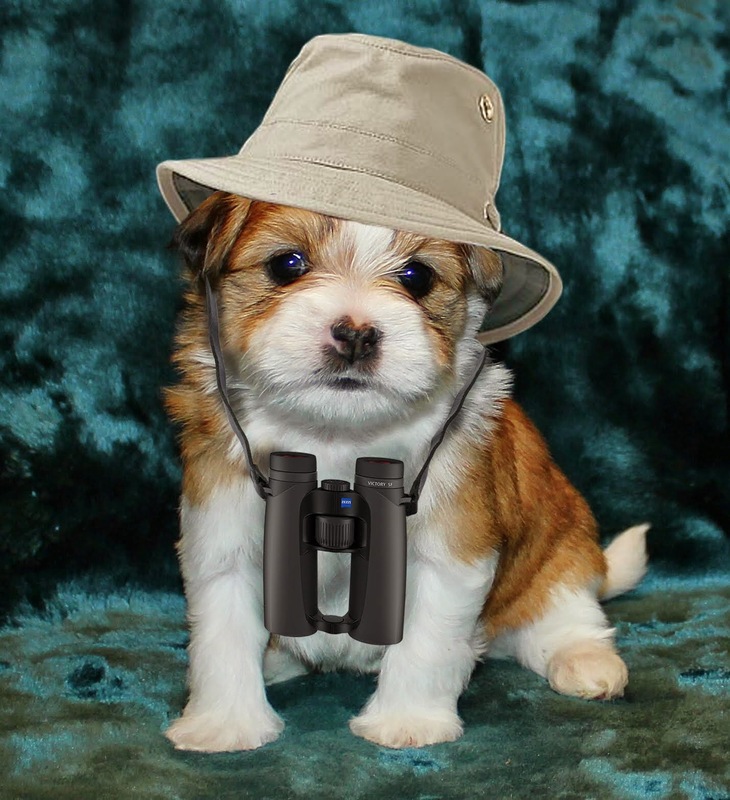 I answered, “White-throated Swifts!” He said, “Huh?” so I handed him my binoculars. He looked up with a confused expression, but the moment he caught sight of the birds, his face broke into a delighted smile, and I could feel my heart leap at the sudden connection. Birding is filled with magical moments—some between us and a bird, and some between us and another human being because of birds. That's why the quote “Life is not measured by the number of breaths we take, but by the moments that take our breath away” so resonates with me and other birders. 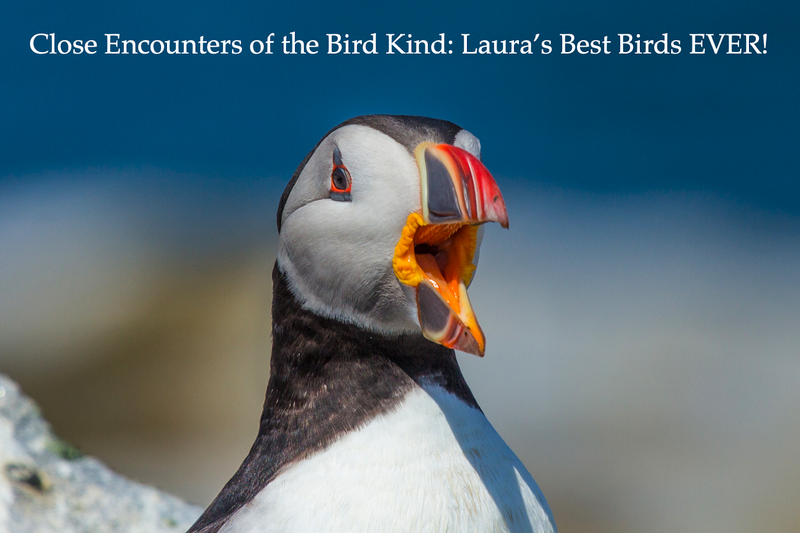 I don’t think it’s fair to say that the measure of the life of a birder is in any way better than the measure of the life of anyone else, but awareness of birds sure provides lots of opportunities to experience moments that take our breath away. When I read the quote, “Life is not measured by the number of breaths we take, but by the moments that take our breath away,” on Facebook, it was unattributed, and so I tried to track it down. It wasn’t in my Bartlett’s Familiar Quotations—my copy was copyrighted 1980—so I tried a Google search. Many sources attributed it to Maya Angelou, but none with an actual citation to a poem, speech, or anything. Some attributed it to George Carlin, but Snopes.com debunked that. Others attributed it to a minister, but from what I could tell, it was being quoted from before he used it, so he apparently worked it into an essay without indicating it was from someone else. The most compelling information I could find was that it was written by a Canadian man who wrote it for a greeting card for Carlton Cards in the mid-1970s. I wrote an email to Carlton Cards asking about it, and will post any response they send. Meanwhile, one of my friends posted a quote attributed to Abraham Lincoln that may be the original inspiration for this quote: “And in the end, it's not the years in your life that count. It's the life in your years.” Unfortunately, so far I cannot find the citation, so don’t know whether this came from Lincoln’s words in a speech, a letter to someone, or what. Let me know if you have a citation for it, or any other information about the first quote I used. Transcript of For the Birds for January 12, 2012. 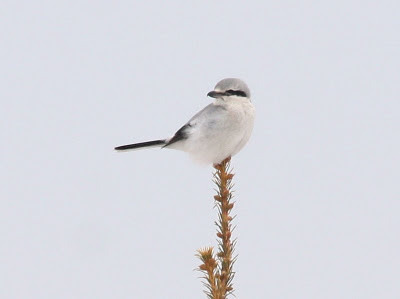 This photo, taken March 17, 2006 when she was first banded, is of the Northern Shrike who is now the oldest on record. Photo courtesy of Ryan Brady. Copyright 2012 by Ryan Brady. All Rights Reserved. My friend Ryan Brady is one of my favorite people, combining superb birding skills, depth and breadth of ornithological expertise, a commitment to conservation and education, and engaging enthusiasm. Ryan is the bird monitoring coordinator for the Wisconsin Bird Conservation Initiative. 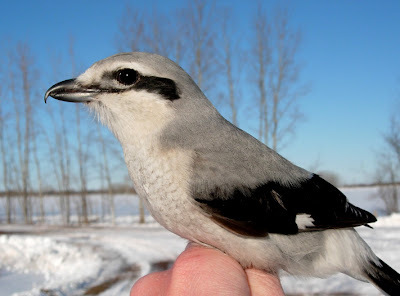 This week, I was elated to read one of his facebook posts starting, “The oldest known Northern Shrike in North America lives on!” He was reporting about a Northern Shrike that he’d banded in 2006 as part of a research project he does in conjunction with Northland College. This shrike has returned to Ashland for seven years now. She’s already on the Patuxent Wildlife Research Center Bird Banding Laboratory’s website as the longevity record holder for Northern Shrikes. Other shrikes may be older, but we can’t know without tracking banded birds. I had to get more information about something this cool, so I called Ryan. Since 2005, he’s color-banded more than 100 Northern Shrikes, giving each a unique combination of color bands which has allowed him to keep track of individuals while they’re in his neck of the woods in winter. This project is the only study of Northern Shrikes currently taking place in the United States. Ryan told me that on March 17, 2006 he caught and banded the record-setting female, who was already an adult. It was impossible to know how old she was at that point, but she must have hatched in the summer of 2004 or earlier. Ryan put a regular US Fish and Wildlife Service aluminum band above a dark blue color band on her right leg and a white color band on her left leg. Every year since then she’s returned to the same winter territory around the Ashland airport. Most years he finds her throughout the season in the open habitat around the airport. 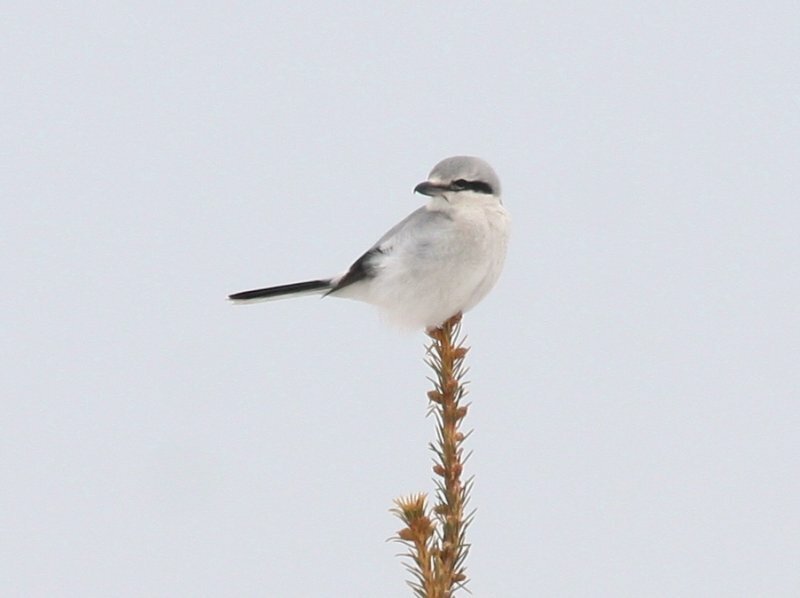 The oldest Northern Shrike on record. This photo was taken on February 27, 2011. She was seen again on January 8, 2012. Photo courtesy of Ryan Brady. Copyright 2012 by Ryan Brady. All Rights Reserved. For two winters he conducted a radio telemetry study, tracking the movements of 11 individual shrikes. He tracked this female’s movements in January and February of 2009, a year when rodent populations were very low. Ryan found her in town a lot, as much as three miles from the airport. She was presumably taking backyard birds because 2009 happened to be a banner year for siskins and crossbills. The next year, the rodent population was back up and she was back spending all her time on her territory by the airport. The 11 shrikes he tracked in that telemetry study held territories averaging about 450 hectares, which is about 1100 acres, or 1.75 square miles. The smallest territory was only about 30 hectares. This female’s territory in 2009 was by far the hugest, about 1600 hectares. This week Ryan also had another marked bird return—an adult male bird that he’d banded in April 2009 who is now 3 and a half years old. This is older than the shrike in second place on the Patuxent longevity webpage. Shrikes show strong site fidelity, but when we see a shrike in the same place year after year, we can never be certain that it’s the same individual unless it’s banded, because the previous year’s bird may have died or for some other reason not returned, only to have the available habitat occupied by a new bird. Ryan Brady is going to be the Friday night speaker at the Sax-Zim Bog Winter Bird Festival on February 17, talking about his shrike project and the record-breaking female. He’ll be showing up-close-and-personal photos of many of the shrikes he’s worked with as he discusses how he ages and sexes them and what he’s learned about winter site fidelity, home range size, physiology, and more. The Sax-Zim Bog Winter Bird Festival always has interesting speakers and great field trips, but this one may be the best yet. When I moved to Duluth in 1981, Evening Grosbeaks were immediately woven into the fabric of my daily life. We heard them in our box elders as we lugged boxes into our new house and they were the first species to visit our feeders. Their calls provided background sound indoors and out. Their numbers were down in summer, up in winter, and huge during spring and fall migrations, but season after season, year after year throughout the 80s, Evening Grosbeaks were in my yard. I had better luck with them than many people because my box elder trees drew in flocks flying overhead, but just about anyone in Duluth with platform feeders offering sunflower seeds had Evening Grosbeaks back then. By the early 90s, grosbeak numbers seemed to be declining. I was very concerned, but thought it was part of a disturbing pattern in Duluth—during this same period, my neighborhood lost all of our nesting Tree Swallows, Red-eyed Vireos, and Yellow Warblers, and the huge waves of migrating warblers and thrushes in my backyard had dwindled. 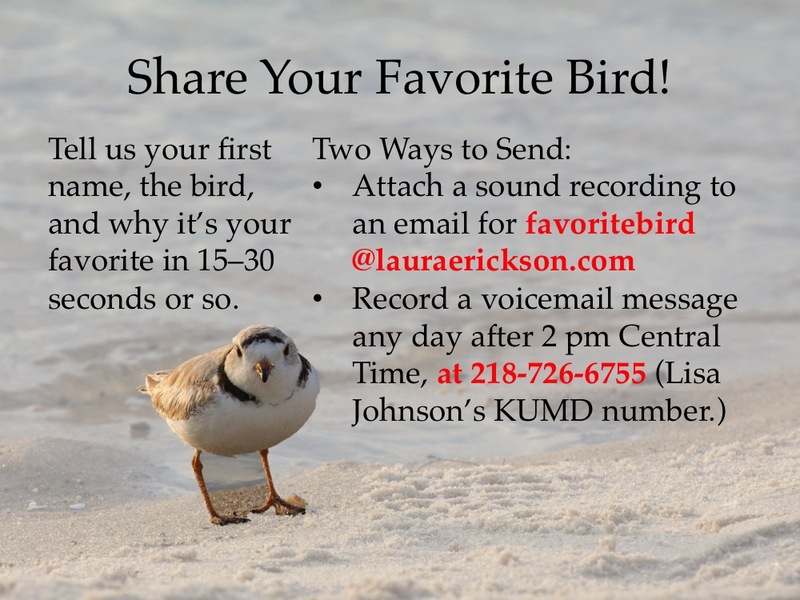 Friends of mine who lived in Duluth for several decades before I did also noticed the disappearance of local nesting species then—birds which have not returned. Evening Grosbeaks were counted on every single Christmas Bird Count from the start in 1979 until 2002, when not one appeared. There were a handful in the following years, but 2011 has now been the third year in a row that they weren’t found at all on Duluth’s Christmas Bird Count. The pattern of Christmas Bird Count data for all of Minnesota shows a very steep climb in Evening Grosbeak numbers peaking in the mid-60s. The pattern of data for Wisconsin Christmas Bird Counts shows the same steep peak, only in the early 70s. In Michigan, where Christmas Bird Counts have a longer history, the graph peak is more sustained, from the early 60s through late 70s, but shows that same troubling decline since then. Some birders and ornithologists dismiss the current, widespread, and huge decline of grosbeaks in much of their former range with the argument that their former abundance may have been nothing more than an historical blip. The Christmas Bird Count patterns do imply that Evening Grosbeak numbers were quite low before the 1950s and 60s in these three states, but I suspect that’s due to the low participation before that time, particularly in the northern reaches of these three states, where the grosbeaks were most often found. The Christmas Bird Count began in 1900, but had very few participants for decades, and provides no information whatsoever for the 1800s or earlier. Breeding Bird Survey numbers in all three states have declined significantly since the 1960s, when the survey began—sadly, this survey can’t provide any information from before then. It is interesting to speculate about a possible population cycle that lasts many decades, or about an inexplicable historical blip, but the simplest explanation for the drop in Evening Grosbeaks numbers in the Great Lakes region in the past two decades, the explanation Occam’s razor would ask us to consider first, is that the population actually has declined, and is a serious conservation issue that deserves serious study. Yesterday I mentioned that 2011 was the third year in a row that not a single Evening Grosbeak was found during Duluth’s Christmas Bird Count. Before 2009, the only other year in our count history that no Evening Grosbeaks were found was 2002. No one understands why Evening Grosbeaks underwent a huge decline since the late 1980s to the point where they’ve disappeared altogether from many areas. I had a flock of about 16 in my neighborhood every day for about six weeks this summer, including adults feeding young birds, but this group was the only one I’ve had in years, and I haven’t seen one since my group left on September 15. I’m sure Native Americans were aware of Evening Grosbeaks before any record was made of them in written English. Indeed, the Ojibwe name for them, as transcribed by Henry Schoolcraft in 1823, was “Paushkundamo,” derived from their word for breaking something such as a cherry or berry, referring to the grosbeak’s style of eating. Schoolcraft also provided the first record ornithologists have of the existence of the species, a grosbeak shot with an arrow by a child in Sault Ste. Marie on April 7, 1823, when the bird could have been either a resident or a migrant. (See T.S. Roberts The Birds of Minnesota.) This and the fact that local native people had a word for this bird don’t prove that the species was regularly found in Michigan through earlier times, but it is consistent with that probability. A comprehensive study of the species, published in 1940 by James Baillie, mapped 82 summer records which formed an almost continuous belt in the US and Canada from southeastern Manitoba through eastern Ontario, concentrated mainly in the Great Lakes. Later expansion east of that band was attributed to plantings of box elder, the seeds of which are one of the grosbeak’s preferred food sources. Until feeding birds sunflower seeds became a common hobby, I don’t think most people living among them would particularly have noticed Evening Grosbeaks. They are secretive nesters and have no song associated with courtship or territory. They usually stay within the branches of trees, eating a variety of seeds and fruits. Adults are pretty much entirely vegetarians—people maintaining non-breeding Evening Grosbeaks in captivity, even over a two-year period, found that they did not eat any insects offered to them—but they are known to feed their growing chicks a variety of insects including spruce budworms. Whether losses of grosbeaks are related to controls used against this forest pest is not known. The species is incredibly difficult to study, both because it’s so secretive during nesting and because it wanders so very widely. But despite the difficulties a solid study of grosbeak population trends poses, it seems imperative to start trying to tease out what has happened and what is happening now to its population. If its dwindling numbers are indeed reflective of a problem, it’s important to figure that out while there’s still time to turn things around for this beautiful bird.